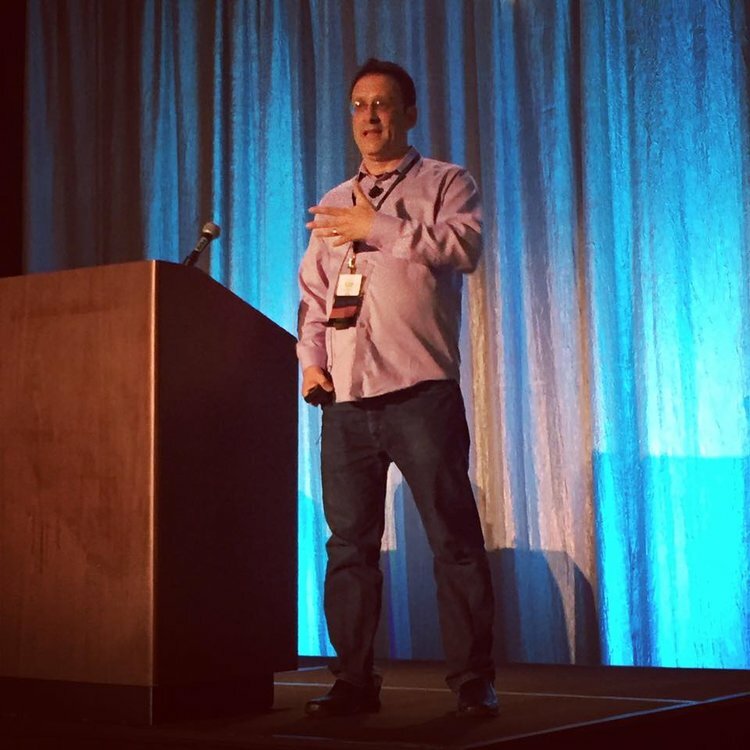 My conference presentation went as well as I could have hoped for... over 100 live and Live Stream participants took in the importance of the blending of mindfulness and EMDR therapy, and the possibility that this combination could successfully improve addiction treatment outcomes. There were so many direct and ancillary reasons for how well it went. First of all, the opening plenary session from Dr. Gabor Mate was everything we all hoped it would be. For me and my two Refuge Recovery Center therapists that were there as well, it was a stunning validation of everything we are doing at Refuge Recovery Centers for over an hour. Every minute or so we would look at each other, either silently or whispering out loud saying, "He just said we are on the right track!" Dr. Mate's message that unprocessed trauma is at the heart of addiction, and his message in a break out session later in the day that most of our physical and emotional problems can be found at our core of unprocessed traumatic memories and unexpressed anger -- these were the perfect lead in for my thoughts presented the next day. My presentation started on the right foot when Susan Brown provided my introduction, she being for years at the forefront of promoting the use of EMDR therapy in the realm of addictions. Susan was responsible for some of the strongest research on how to use EMDR in a treatment setting (in her case in a drug court program with Seeking Safety as the main additional stabilizing element). Also present was AJ Popky, one of the original therapists around Francine Shapiro when she developed the therapy, and also the developer of the DeTur Protocol, the first addictions specific protocol that is still in use today. Finally, my original mentor and trainer, Andrew Leeds, was very supportive and in my corner that day, he having provided several references to mindfulness in his presentation on the mechanisms of action in EMDR therapy. So what I came home with were these things... my presentation seemed to resonate as evidenced by the feedback afterward from many at the conference. I had great meetings with leaders in the field regarding how to push further into the world of research regarding EMDR and Addictions in particular. I also came home with a handshake deal that then turned into a signed publishing contract with Springer Publishing Company, a leader in books on Health Care and the Helping Professions, and the absolute leader in books on EMDR therapy. The book on EMDR Therapy and Mindfulness for Trauma Focused Care that I have been working on diligently with my writing partner and colleague (and founder of the Institute for Creative Mindfulness) Dr. Jamie Marich is now due to come out in Spring of 2017. Lastly, I came home with a name for what it is I am doing at Refuge Recovery Centers and hope to have the opportunity to provide at any and all treatment centers where this message resonates. The method or protocol is now called MET(T)A, or Mindfulness and EMDR Treatment Template for Addictions (or Agencies). The META is signifying the "meta" use of the EMDR standard protocols as a template for running an agency, and the METTA of course is loving kindness, our ultimate goal in our delivery of trauma informed and trauma focused treatment. You can go for more information to www.mettamethod.com which is the website I have established in order to move forward with what inspired the conference presentation and what we have developed and implemented at Refuge Recovery. I look forward to more presentations, more opportunities to consult with agencies, and getting to work on research of the MET(T)A method as it has been rolled out at Refuge. Thank you for reading this blog series about the 2016 EMDRIA Conference, and see you along the path! Dr. Jamie Marich and I are well on our way to completing our manuscript regarding Mindfulness and EMDR therapy as a new template for treating addictions.. In this article with Serene Scene Magazine, we outline some of what we are writing about and previewing what we will be presenting at the Evolution of Addiction Conference in February of 2017. I have high hopes for this presentation, whether it be an immediate effect from the presentation itself, or just a first step on a path toward a new way of looking at treatment. I feel that there are a great number of wonderful therapies, old and new, that are already engaged and others that are poised to take on this world filled with trauma and the effects of trauma. Professionals from various theoretical orientations are trying their best to bring healing to those that suffer. My hope is that this model of EMDR therapy anchored by Mindfulness as a framework for treatment will resonate. I feel that the AIP model and the 8 phase protocol are now ready to enter a new stage of development, with no big adjustments, only with the wide angle, long range view of developing treatment centers that are not only trauma informed, but trauma focused. Mindfulness provides the core of the stabilization and preparation for trauma reprocessing, and EMDR therapy's trauma reprocessing phases do what they have been shown to do for many years now. This applies not only to single incident trauma, but with all the modifications provided by many researchers and practitioners over the years as well as by those working in other modalities, we can apply this to the developmental trauma, attachment trauma, and Complex PTSD we see in so many of our clients. This applies to our addiction clients and those without addictions. This applies to utilizing the wisdom of trauma reprocessing and mindfulness to provide a complete healing template for individuals and the communities that treat them. Going forward myself, my hope is to continue training as many therapists as possible in EMDR therapy by providing EMDRIA Approved Basic Training through the Institute for Creative Mindfulness. My hope is to help agencies to integrate this thinking into their treatment philosophy and then put it into action. My hope is to train EMDR therapists, supervisors and consultants in rolling out these kinds of programs. My hope is that my book Clinical Dharma can help providers to maintain their own wellness as they do so. And my hope is that my almost completed book with Dr. Jamie Marich on Mindfulness and EMDR Therapy as the new paradigm for trauma informed treatment will help all of it along. Most of all, my hope is that all beings may be free from fear, all beings may be healthy, all beings may be healthy and the all beings may be at ease. May the work we all do contribute to this lessening and perhaps ending of suffering. My presentation for the 2016 EMDRIA Conference did not occur in a vacuum. A number of factors came together and created what it is I hope to describe in Minneapolis. First of all, I was introduced to EMDR over a decade ago, and quickly became committed to it being a central aspect of my therapy practice. I then was led by Dr. Andrew Leeds through the steps to becoming a Certified Therapist and then an Approved Consultant, finishing that AC process with Dr. Jamie Marich. Then the invitation came from Jamie to join her Faculty for her Institute for Creative Mindfulness, so that I might help to train therapists in EMDR in Los Angeles and beyond. All of this was concurrent with my continuing commitment to a Buddhist mindfulness practice, and a career in the world of addictions treatment. I have always strived to implement mindfulness and other related Buddhist elements to the treatment centers I have been a part of, but it always seemed like an add-on at best, sometimes almost an oddity or a marketing point. So when Noah Levine approached me to help develop Refuge Recovery Centers and to be the Clinical Director, all of these elements came together, and became central to the delivery of treatment. When I asked Noah for his go ahead to meld my two long term experiences into the treatment model, he was quick to say yes and offer his support. We have been walking forward with this model ever since. What does that look like on a day to day level, and on how we plan for the future of treatment? The first order of business was to train the clinicians at Refuge Recovery in EMDR therapy. Using the EMDRIA Approved Institute for Creative Mindfulness curriculum, I provided the full Part 1 and Part 2 training and consultation for our clinicians. Noah and our staff psychologist Dr. Josh Lichtman went through Part 1, and scheduling conflicts have kept them from completing Part 2, but that is in the works. We conducted the training in 1 day segments rather than two 3 day segments in order to minimize the disruption to clinical services. The feedback from the clinicians was extremely positive. All of our team related to the AIP model, the importance of trauma informed (or in our case, trauma focused) care, the possibility of ending the addictive cycle through a titrated use of EMDR therapy, and the value of using the 8 phase protocol as a treatment planning device for the overall treatment of the individual as well as the running of the agency. Our Buddhist mindfulness focus gave our clinicians confidence that we could provide the maximum resourcing and stabilization experience for our clients in Phases 1 and 2 of the protocol, and our all being trained in EMDR gave us the feeling of a common goal. Our clinical meetings and supervision include the language of the AIP model and the 8 phase protocol. Our goal for treatment is to provide a container where we can help the client stabilize sufficiently to be able to reprocess trauma and adverse life events in order to maintain a sturdier relapse prevention program and sustain a more adaptive life. This focus has not eliminated the other modalities that are found in addictions treatment like motivational interviewing, 12 step support (and Refuge Recovery involvement), exercise, yoga, family systems work, psychoeducation about addiction and the rest. It actually instead gives a context for these modalities to have more power and focus. Looking at the horizon of trauma resolution helps these other modalities have a greater impact and a better sense of direction. First of all, kudos to those who have helped this work get under way. 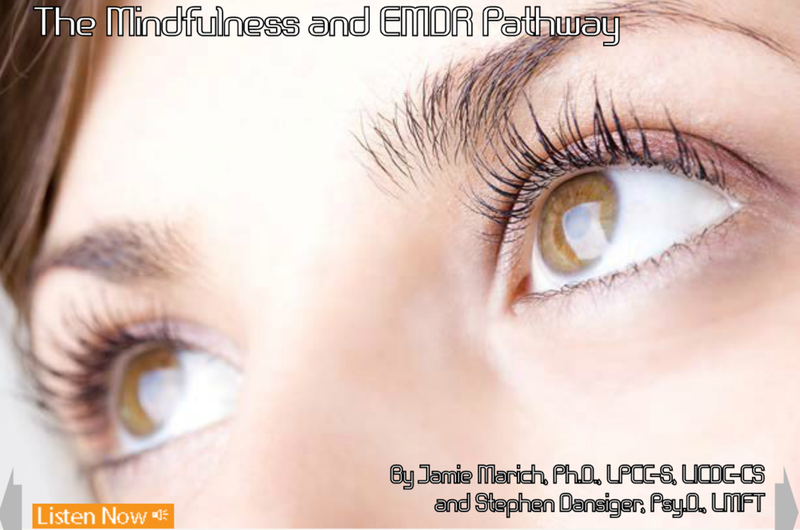 Dr. Jamie Marich and I are well into writing our book on this subject of mindfulness and EMDR therapy. It is incredibly meaningful to me to have found such a strong and committed partner in this endeavor. Another strong partner in this creation of a mindfulness based EMDR perspective has been Noah Levine. As we explored the possibilities of what a treatment center focused on the Refuge Recovery program would look like, I was clear that EMDR therapy, the 8 Phase Protocol and the AIP model should be at the center of the work that we do. Noah made his decision very quickly to trust my intuition and my training, and we have moved forward with this very exciting project. My mindfulness story begins with my sobriety. Very early in my recovery 27 years ago, I was brought to a Zen Buddhist monastery in the Catskill Mountains of New York for an AA retreat. I received my first zazen ("sitting Zen') lesson at that time, and I have never stopped practicing. The practice has brought me all over the world as a practitioner, and into many venues as a guide. It brought me to a year residency at that same monastery, and an ongoing sitting and teaching practice. It brought me then to Against the Stream Buddhist Meditation Society, where I entered the teachings in the lineage of the Thai Forest Masters, Jack Kornfield, and Noah Levine. The (current) end result is that I am deeply embedded in the the 4 Noble Truths, the 8 Fold Path and the many other teachings of the Buddha. I am committed to practicing and teaching not just how to become more able to concentrate or be in the moment in a superficial fashion, but rather the development of wisdom and compassion, ethical living, and deep and dedicated mindfulness practices. As I studied trauma as a therapist, and then studied it through the lens and practice of EMDR therapy, I saw that EMDR was a mindfulness based therapy at its core. The first two phases require the development of a mindfulness practice in order to find enough of a ground to do this difficult work. The reprocessing phases of the therapy are built on the foundation of the development of mindfulness of what had been relegated to the unconscious, the body, or the non-cognitive areas of the brain. Through mindfulness and through the mindful attention instigated by the 8 phase protocol, clients are able to achieve the beneficial effects of EMDR therapy described thoroughly and widely in the extensive research literature. As Dr. Francine Shapiro (the creator and developer of EMDR therapy) has said, we are able to bring maladaptively processed traumatic memories to adaptive resolution, and then we are able to live a more adaptive life. My conference presentation is about what happens when you take these principles, ideas and practices and place them at the center of the work of an addictions treatment agency. We are doing that at Refuge Recovery Centers right now, and other agencies are approaching me about the model. I have come to these conclusions, that EMDR therapy and mindfulness should go hand in hand; that mindfulness is not just a technique, and neither is EMDR therapy; that if we are to truly make a difference in clients' lives when providing addiction treatment, we need to find a way to genuinely help them through their trauma work; and that this will occur best using an agency wide and community based model that rests on the foundation of mindfulness, EMDR therapy, the 8 Phase protocol, and the AIP model. More practice and research will reveal whether this approach will be successful. The initial findings are very promising. Addiction treatment has come a long way in the last 81 years since the advent of Alcoholics Anonymous. All through the millennia that preceded, alcoholics and addicts met a variety of fates, most of them revolving around being swept aside, incarcerated, becoming ill, dying. Those options remain, but there have been advances in the ways that we try to be helpful to the sufferer. Spiritual and pragmatic solutions, support from fellow addicts, these are all impactful interventions that have helped save lives. We now have a new opportunity to grow in our ability to set up treatment centers to succeed. The research is growing and the anecdotal evidence most certainly shows that trauma, both above and below the threshold of diagnosable PTSD has a big impact on addiction treatment outcomes. There is an ongoing debate as to when and if trauma resolution can happen for an addicted person, since the addiction and its consequences are so destabilizing. A true Catch 22 -- we have to stabilize a person with a possibly destabilizing intervention, so perhaps we don't use the intervention, possibly leaving the person destabilized, ad infinitum. When one witnesses the sometimes revolving door nature of treatment centers, one wonders if there is a solution. The theory I am working with in the design of Refuge Recovery Centers and other centers that are starting to request my consultation services is this -- if reprocessing and resolving the trauma of addicted people is going to be crucial in their achieving and maintaining long term sobriety, then lets turn to EMDR and its remarkable success at bringing traumatic memories to adaptive resolution. We can do this as a treatment center by using Shapiro's 8 Phase Protocol as a 30,000 foot view of the activity of the center, the 10,000 foot view of the treatment planning for the individuals in treatment, and then down on the ground using the trauma reprocessing phases of the protocol as written for the sufferer. The higher views are where we are hoping to make a difference in the way addiction treatment is delivered. Over the years, centers have either ignored the impact of trauma and neglected to include any trauma informed interventions in their treatment, while others may provide a smorgasbord of innovative or evidence based treatments to try and address the traumatic precursors and consequences of addiction. Here we look through the lens of the protocol, particularly the first two phases focusing on assessment, preparation, resourcing and stabilization, for the answer to improve short and long term outcomes. This treatment theory rests upon both Buddhist mindfulness and EMDR. Buddhist Mindfulness as described in the 4 Noble Truths and the 8 Fold Path, with its focus on developing wisdom, living ethically and practicing meditation, provides the main container for the first two phases of treatment. Along with other best treatment practices, helping the sufferer to find a way to quiet the mind sufficiently to engage in the other challenges of new sobriety is crucial. And this work also prepares the person for potential trauma reprocessing work at some juncture of the treatment experience. If they are not ready during a residential stay, then perhaps in PHP. If not, then IOP or OP. And if it still is not appropriate as determined by their therapist and treatment team, then perhaps upon their return to the community. The main change provided by this view is that we are setting our sights on trauma resolution, we are setting our sights on trauma informed care, we are setting our sights on treating the underlying causes of addiction. Another aspect of this theoretical orientation and treatment approach is the education of the community and the increase of trauma informed and trauma focused services in the community. I look at the EMDR Basic Training that I am delivering to therapists throughout the Los Angeles area (and beyond) as a safety net out in the world for those who come out of treatment and need continuing care that includes EMDR and mindfulness. The hope is that anyone suffering from addiction can find trauma focused and mindfulness based treatment along the complete continuum of care. There needs to be research done on this model, and I am excited for it to start. At Refuge Recovery Centers, we are beginning to gather qualitative data so that we can continue our work and improve upon it. The initial response to the treatment has been favorable. Clients are able to utilize mindfulness practices, understand attachment theory, develop a more resourced relationship to their mind and body. And many of our clients who have suffered for years with the same traumas that are dispassionately described for the umpteenth time during an intake interview are in the process of reprocessing those traumas. They are reporting a relief that they were never able to find, no different than all the other reports I receive from people who often find in EMDR trauma reprocessing a first time experience of healing. That correlation makes me think this model could work in other settings focused on other diagnoses as well. Again, more will be revealed. All of the clinicians at Refuge Recovery are either fully trained in EMDR or in the midst of their EMDR training. The staff receives trauma training that includes the language of EMDR. The clinical meetings discuss clients from the perspective of where they are in the paradigm of the 8 phase protocol, and where they are in their progress with mindfulness and associated Buddhist practices. This is the day to day practice of the theory. More will be revealed over time. I am very excited to present all this at the conference, and I hope to see and hear more related developments as we all try to bring healing to those suffering from addiction.